LaVon Vokoun, 92, of Premier Estates in Toledo, passed away on Sunday, January 28, 2018, with her loving family by her side. Funeral services will be held at 10:30 a.m. on Thursday, February 1, 2018, at the Mitchell Family Funeral Home in Marshalltown, Iowa. Visitation will be from 9:30 a.m. until service time at 10:30 a.m. also at the funeral home in Marshalltown. Memorials may be directed to Living Faith United Methodist Church in Montour or the Montour Community Center. For condolences or questions please visit: www.mitchellfh.com. or call 641-844-1234. Mitchell Family Funeral Home is caring for LaVon and her family. Lillian LaVon Cory was born on April 23, 1925, at home in Tama, Iowa; she was the daughter of Walter Rowe and Vera (Buckingham) Cory. She attended country school in rural Tama and attended high school in Tama graduating with the class of 1943; she then attended Business School in Waterloo, Iowa. LaVon worked for Tama County Sheriff’s Department in the Tama County Court House before the birth of her children. On October 17, 1948, LaVon was united in marriage to Clyde Vokoun in Tama at the Methodist Church; after they were married they resided near Quarry, Iowa and then in 1956 purchased an acreage near Montour where they lived their entire married lives. LaVon was a devoted farm wife, mother and grandmother; she raised a big garden and canned her produce, she did chores and farm work. 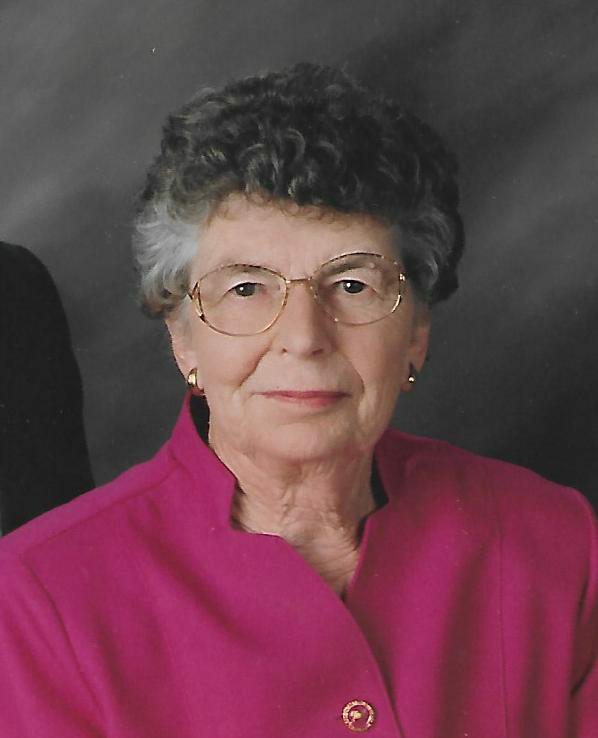 She was a member of the Living Faith United Methodist Church in Montour, Iowa, neighborhood birthday club, funeral lunch coordinator, helped with senior meals at the Community Center, 4H leader and worked during the elections at the Polls. Left to cherish LaVon’s memory is her husband of 69, plus years, Clyde; daughter, Wileen (Gerald) Connor, of Cedar Rapids, Iowa, and sons, Corwyn (Robbie) Vokoun, of Nevada, Missouri and Brian (Martha) Vokoun, of LeGrande, Kentucky; grandchildren: Katie (Sean) Shea, of Cedar Rapids, Iowa, Laura (Mauricio) Rodriguez, of Houston, Texas, Curtis Connor, of Cedar Rapids, Iowa, Creighton Vokoun, of Bozeman, Montana, Derek (Jasmine), of Springfield, Missouri, Tristan Vokoun, of Camp Lejeune, North Carolina, Amanda Vokoun, of Lexington, Kentucky, Erik Vokoun, of Louisville, Kentucky, and great-grandchildren: Connor and Brady Shea, Anna Kate, Mason, Eva and Lillian Rodriguez. In death LaVon rejoins her parents, Rowe and Vera Cory; sister, Doris Dieken and a baby daughter at birth, Wenda.